GUST is a kinetic field of color along Discovery Green’s Brown Foundation Promenade. 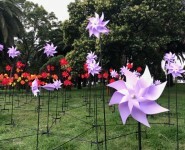 Commissioned by the Discovery Green Conservancy’s Public Art Committee from Mexico City-based design collective Cocolab, the interactive, site-specific artwork brings to life the invisible patterns of the wind with vivid color, subtle motion and patterns of light. Inspired by simple celebrations of community and by folk traditions of hand-made art, GUST aims to provide a joyful gathering place for people to come together, to feel and see the breeze, and to play. 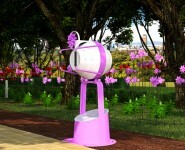 Intended to be playful and interactive, GUST also invites guests to “be the wind” and make the pinwheels turn. There are four stations where visitors can play with the art. At night, the installation is illuminated by patterns of light, which respond in real-time to the changing direction of the breeze. Transform your space meaningfully. Find out how. We are trusted art consultants who have built a reputation on listening to our clients, understanding their goals, enhancing their aesthetics and minding their budget considerations. When partnering with public, private and corporate collectors, we recognize that owning art is a reflection of their personas.